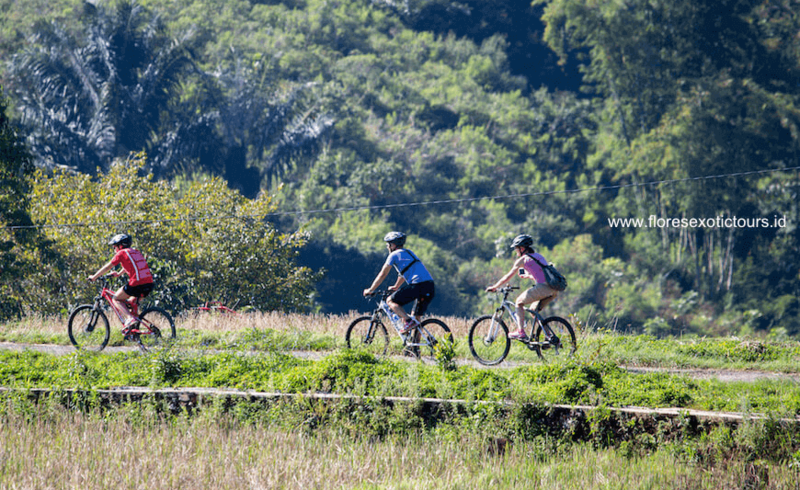 Flores adventure cycling, camping and kayaking, offers you the best way to enjoy and explore Flores Nature, Culture and People. Arrive at Ende airport, Our English speaking guide will pick you up at the airport and drive to Moni. Cycling starts from Nduaria village to the hotel. It takes 1 hour. Dinner and overnight at the Kelimutu Eco Lodge in Moni. Cycling time: 45 Minutes, Downhill cycling. In the early morning at 04.00 am the car takes you to the three colored lakes of Kelimutu, one of the most spectacular and mysterious sights in Indonesia. You will witness a beautiful sunrise. Then you return cycling to the hotel starting from the parking area of Kelimutu. After having breakfast in the hotel you continue the trip by car to Nduaria village, continue by bike to Ende, 40 km, 3 hours. Afternoon cycling from Hotel to the harbor of Ende for about 30 minutes, 5 km, and enjoying the sunset. Dinner and overnight at Grand Wisata Hotel Ende. Cycling time: 4.20 Hours, Road cycling, almost downhill. Start cycling for 30 km,2,5 hours. Passed the coastal road till Nangapanda, stop in Penggajawa to see the blue pebbles beach. Continue by car till Mangulewa village, second cycling tour awaits start from Mangulewa village to Bena traditional village. From Bena by car to the Hotel, Dinner, and overnight at Manulalu Villa. Cycling time: 3.5 hours, Road cycling, Flat, Uphill and downhill cycling. Drive to Bajawa, Start cycling to the hot springs of SOA. You will have time to take a relaxing bath there. Then continue to Riung, cycling from Wangka village till Riung, arrive in Riung, continue by boat to Pulau Tiga. Camping in Pulau Tiga, Riung Marine Park. Cycling time: 3 Hours, Road cycling, Downhill and uphill. Camping equipment will be provided, camping site: on the beach of Pulau Tiga or Rutong Beach, Riung Marine Park. Cycling time: 2 Hours, Flat, Up and down hill, almost offroad cycling. Breakfast at Hotel, Kayaking start from Hotel passed Buntal river to the coastal, enjoying untouched nature and beautiful scenery along the river, it takes more than 3 hours, pick up on the beach and drive to the hotel, afternoon free program or visit local villages. Overnight and dinner at 4 Pohon Lodge/Flores les 4 Arbes in Buntal. Cycling for about 27 km from Buntal to Pota, on the way, enjoyed the land and seascape, some photo stop at Batu Pajung beach, in Pota you will visit Rana Tonjong, the giant lotos, which only find in India and in this place, continue cycling to Nanga Baras, then by car to Dampek, Lunch at Local Family house in Dampek, and continue by car to Ruteng. Dinner at local restaurant and overnight at Shinda Hotel. Cycling time : 3 hours, on the north costal of Flores, almost flat, road cycling. After breakfast, you will discover the beautiful surrounding of Ruteng during a four-hours cycling tour from Ruteng to Kenda, to Ting village and Watu Alo. On the way, you see the impressive scenery of rice field terraces. In the afternoon you visit Ruteng Pu’u, a traditional village with authentic old houses in Manggaraian style. Dinner at local restaurant and overnight at Shinda Hotel. After the breakfast drive to Cancar to see the unique Lingko, circular rice fields arranged like a spider web. you go cycling around the rice fields passing the villages of Cancar (ca. 1 hour). On the way to Labuan Bajo in Roe ride the bike downhill until you reach to Labuan Bajo (ca 1.5h). Dinner and overnight at Puri Sari Beach Hotel. After breakfast, you will go for a morning excursion to the Batu Cermin Cave (mirror stone cave). Then we will provide transfer to the airport for you to catch the flight back to Denpasar – Bali, or extend for the trip to Komodo. All our trips can be organized tailor-made at request.